As much as book covers catch readers’ attention, blurbs grip shoppers and convince them to buy books. That’s why you want to write a book blurb that sells. With ebooks, in particular, they are absolutely essential to selling your ebooks. Sometimes coming up with the right words for a book blurb can be more stressful than writing the ebook itself. Don’t worry, in this article, we’ll walk you through the important points to keep in mind while writing your book’s blurb, as well as give you a simple blurb template that sells and some bestseller examples for different genres. Blurbs are a brief description of a book typically found on the back of a book or within the book sleeve of a hardcover book. For ebooks, the description is posted on a book’s purchasing page, along with the book cover and price. The book blurb’s main purpose is to lure readers in and captivate them enough to buy the book. The blurb is often referred to as a synopsis or simply book description. Here are the top ten tips we believe to be the most essential to crafting a book description that sells. To each genre their own, one thing to keep in mind when it comes to writing book blurbs. The content and style vary depending on the type of book you’re describing. The best way to get a clear idea of your genre’s best practices is to run a quick book descriptions search within your genre to see what others have done. Note the popularity of the books as you search. Using techniques that are typical of one category for another category, will only confuse shoppers. Bullet points that work well in business book descriptions won’t compel readers to read a romantic novel. 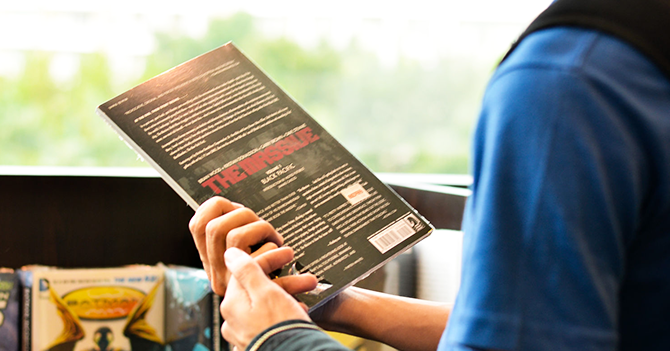 Likewise, the intrigue and suspense and hints at plot twists used in fiction book blurbs will not assure shoppers looking for self-help books that your book holds the solutions to their problems. Children’s book descriptions and poetry book descriptions are whole other fields. Before you begin, start a collection of what you consider the best book blurbs for your category. 2. Give readers what they want. People don’t go out in search of a book with no purpose in mind. Whether it’s for entertainment’s value or to learn more about a specific topic, there’s always a reason. Your job is to figure out what said reasons or motivations are and highlight how your ebook will fulfill their needs. 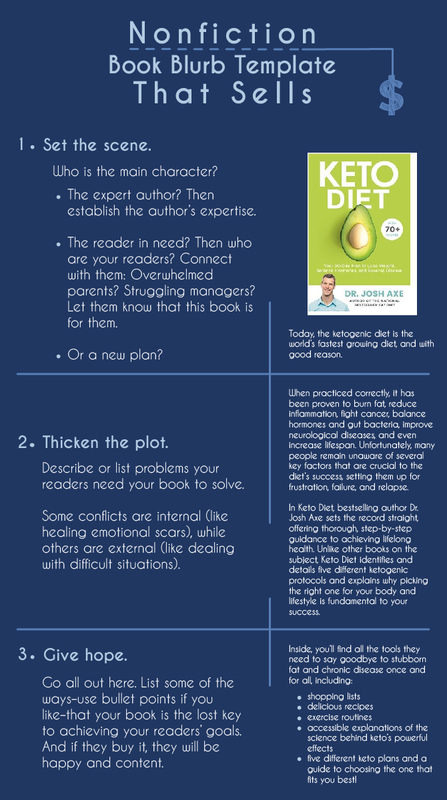 You probably already did the research before you started writing the book. Pull up that list again now. Say you’re a gym trainer who wants to make money by selling your expertise in ebook form to those who can’t come to the gym. You need to figure out what those people truly want. For example, is it weight loss tips? Is it muscle gain? Whatever it is, mention how your book will help them achieve their goals. Whether your ebook provides training techniques and nutrition advice to lose weight in no time or get ripped fast, tell them now that it’s in your book. Otherwise, they may never know. “You can go after the job you want…and get it! You can take the job you have…and improve it! Did you know Dale Carnegie’s book was originally published in the 1930s? But with those first lines, the book description and the book itself, resonate with readers and feel just as relevant today as it was seventy-five years ago. 3. Start with a hook. Hook them into the blurb. If your first sentence is dull or of no interest, they won’t read the rest of the blurb, and they probably won’t buy the book either. Start with something dramatic, or something that establishes your expertise. You want to pick your book description words to make people want to read the rest of the blurb. The blurb is not meant to be a summary of the book. That can be both boring and a spoiler. Remember that the main purpose of the blurb is to highlight the reasons why your readers should be reading your book right now rather than all that they can find inside the book. Saying no spoilers seems a bit obvious, but here’s where things get a little tricky. You want to tell readers enough about your plot for fiction, or lessons for nonfiction, such that they’ll want to know more. But don’t give up your secrets and all the fun stuff. Rather than tell them what’s inside your ebook in details that deem the book useless in the end, you can allude to all the possible gems they can find in the book that will make it hard for them to resist buying your ebook. Teasing and temptation are your keys here. The list is far too extensive. Readers who haven’t tried these dishes at the restaurant will likely feel both alienated and bored. 5. Aim for 150 words. According to the Amazon book description guidelines, you want the book description to be approximately a 150-word paragraph. For ebooks and print books alike, try to stick to 100 – 250 words. Here are some bestselling books and their blurbs’ word count. Some writers are so eager to convince readers that their book is the be-all and end-all, that they’ll go a little overboard with the description. A person’s general attention span and the time they’re willing to spare to read the blurb of a book are limited. Adhere to the adage, keep it short and sweet — and more importantly to the point. 6. Avoid clichés and cheesy lines. As witty as some expressions and idioms may seem, let’s face it, a lot of them are overused and the only response they elicit is an eye roll. Try to steer away from the ones that are worn out, if you want a blurb that stays fresh for years or at least a few months. 7. Write in the third person. “In her memoir, a work of deep reflection and mesmerizing storytelling, Michelle Obama invites readers into her world” Book Blurb for Becoming by Michelle Obama. 8. Appeal to your readers’ emotions. That may seem obvious for novels, but what of works of nonfiction? Surely this is a place where the methods of ethos and logos, win over pathos. Well, although establishing your credibility and logically convincing your readers are both valuable and possibly necessary, what drives buyers to buy is ultimately emotions. According to Harvard professor Gerald Zaltman, 95% of purchasing decisions are subconscious. Most subconscious factors are in fact emotional. What we mentioned earlier, with regards to fulfilling your readers’ needs, once again applies here. This time, we’re focusing on their emotional needs. Most of us read novels to get lost in another world, so give your readers a world to get lost in. If they lack excitement, give them action and suspense. If they lack romance, give them intrigue and passion. We read self-help books to help us get past problems in our lives, so show us that you know how to get us out of our ruts. Let us feel that you understand where we are, and give us hope that things will get better. 9. Use this template for a book blurb that sells. Which brings us to our final tip, give your blurb a plot. If you’re looking for book description templates, look no further. 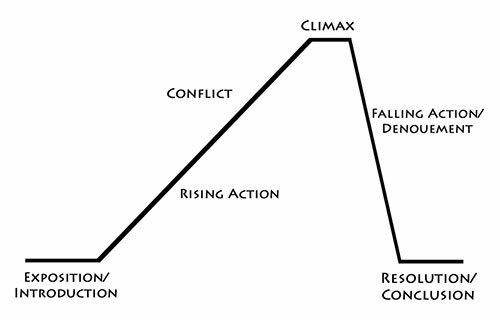 The old plot diagram you studied in school, the same one in every feature film, is the rhythm we as consumers have grown accustomed to and the one we find most satisfying. So there’s no need to go searching for another. We’ll go through a simplified version here. Exposition: Set the tone. Introduce the characters and the setting.For fiction, obviously this is your protagonist and the setting as in the first chapter, but in just one or two sentences.For non-fiction, the main character may be the expert author, so you establish the author’s expertise. Perhaps, the focus is the readers, then who are your readers? Overwhelmed parents? Struggling managers? 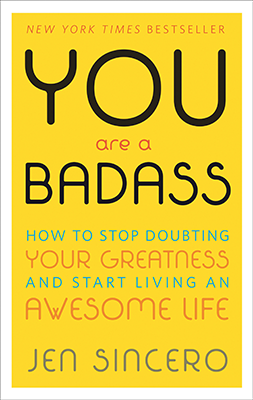 Start by letting them know that this book is about them and for them. Conflict and Climax: If there were no problems, then it wouldn’t be life now would it? And there wouldn’t be a need for any books. Some conflicts are internal—like making personal decisions or healing emotional scars—while others are external—like dealing with difficult situations or getting past obstacles.For fiction, you’ll simply tell how the plot thickens with the seemingly unsolvable conflicts in your novel.For nonfiction, you’ll describe or list a couple of problems that your readers are stuck in and need your book to solve. Here is where you make your readers feel that your book is relatable and where they feel emotionally invested. Resolution: You’ve made your reader uncomfortable with the conflict, now give them relief. So in your book description, you resolve the rising tension your shoppers felt as they read the beginning of your blurb and the conflicts therein, by giving them hope that the solutions are in your book. The resolution, the sense of satisfaction, comes with buying the ebook.For fiction, promise your readers to transport them into the story where they’ll learn first hand how the story unfolds. You may mention possible scenarios to further lure your readers in. Ultimately, your readers will satisfy their curiosity, when they buy your novel.For non-fiction, go all out here. List some of the ways–use bullet points if you like–that your book is the lost key to achieving your readers’ goals. The caveat here is to not spell everything out for them, simply let them know that this book is what they’ve been looking for. And if they buy it, they will be happy and content. There you have it the most basic and most successful template. 10. Write more than one book blurb. When you’re done writing, write another one. Blurbs are short. If you’re in the right mood, you can quickly churn a couple of samples with vastly different tone or even content. 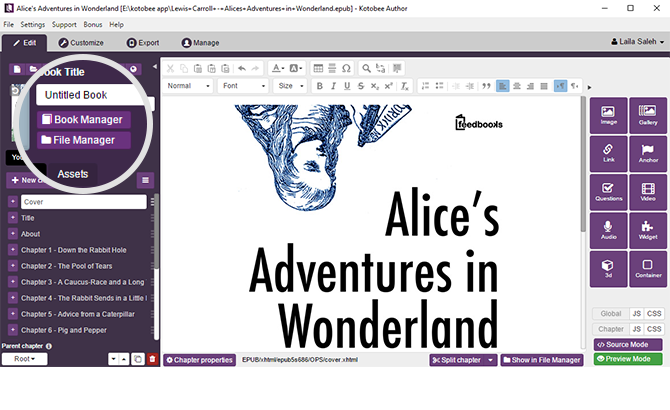 Show friends and fans, two versions of your blurb, and get some feedback. Still can’t decide? If you’re selling an ebook on Amazon, you can quickly and easily change the blurb at any time. So go ahead and test run each blurb, see which one is getting you more sales. In some cases, one week can be enough time to determine which blurb works best for your ebook. Here are some of our favorite examples listed by genre. You’ll find the word count and a little bit about why we like these blurbs. Why this blurb works The blurb showcases a sense of mystery and intrigue that works as a great hook to get readers to want to learn more. Notice the plot diagram at work, as the blurb begins with the exposition telling us about the characters and the setting. Then the rising conflicts follow. 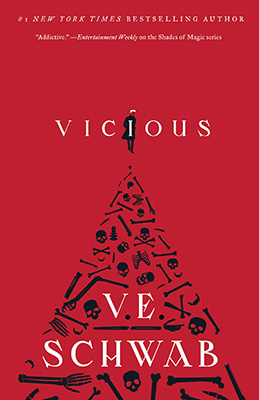 By the end the author has the readers feel as if they are in the middle of this battle for revenge. And finally leaves us with a cliffhanger and only one possible solution: to buy the book. Why this blurb works Not only does this blurb have a hooking first line, its entire content is enticing for the reader, making us decidedly interested in reading the rest. The blurb starts by establishing the author’s expertise and the irresistibility of the book itself. The author does not dwell on the negative problems in our lives but rather barrages the reader with positivity and a feeling of empowerment, that can only be attained through her book. Again, we see exposition, conflict, and resolution at play beautifully and energetically, without giving away any of her secrets. Why this blurb works Heart-warming in the end, heart-wrenching in the middle, and mind-boggling in the beginning, the blurb takes us on an emotional and intellectual journey like no other. This is an extraordinary example of a book blurb that appeals to readers’ emotions. As you read through it, you start to feel for Trevor through his life’s journey, which in turn has you interested in learning more about him. His words eclipse anything we can try to say at this point, like pointing out that it’s written in the third person. 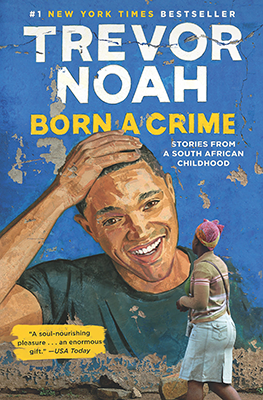 He leaves us stunned and eager to dive into the story of his life, his mother’s and the harrowing circumstances that engulfed them. Why this blurb works The blurb finds a way to appeal to almost anyone. It starts with the exposition, establishing expertise and success. Then provides the conflict in the form of a listing of diseases that the book will help us escape. In my opinion, it was a little too lengthy, but with a list that long, he’s bound to catch just about everyone. 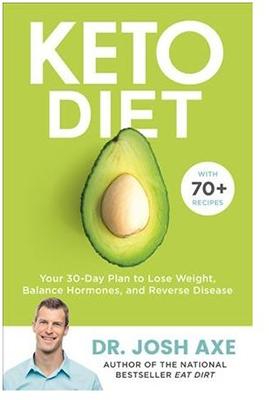 Finally, we find the resolution as the blurb promises to offer the reader all kinds of help, from an explanation to what the Keto diet is, to shopping lists, recipes, exercise routines, and plans to suit your needs. The book blurb presents the book as a solve-all book with the expertise and tools to guarantee you success. 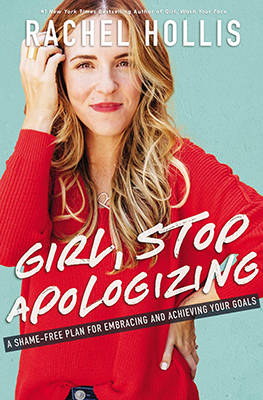 Why this blurb works This book is surely an enticing read for women who feel they’re either oppressed, constantly harassed or merely can’t speak up. Hollis begins by focusing on the key character: the embarrassed and shy women who lack self-confidence. The conflict here is an internal conflict of many struggling women. She then gives the readers faith that she can help them and shows them the light at the end of the tunnel, that can only be attained by reading her book. Why this blurb works This blurb is a good example of giving the readers what they want to read. People want to learn how to make more money, and so this ebook promises to not only help with that but to teach them mistakes and clarify a few misapprehensions they’ve been under. The organization is the same once again. 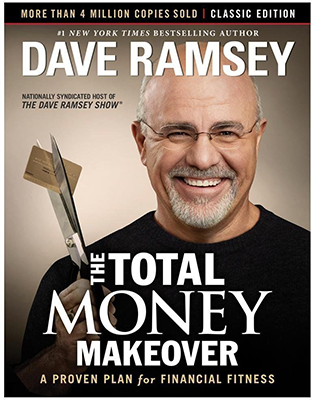 This time we’d like to highlight, how the Author Dave Ramsey, makes his book stand out from the crowd with his outlandish metaphors and puns, making his potentially overwhelming topic of finances as simple and familiar as eating right and getting fit. 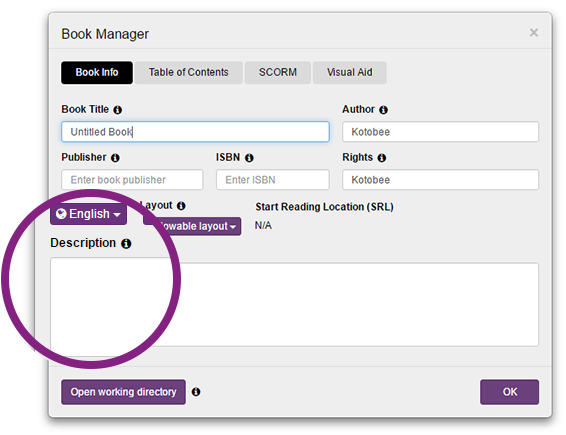 Now that you know how to write your book description, let’s see how you’ll add the blurb to your ebook in Kotobee Author. The simplest part of this whole article, you’ll open the Book Manager from the Edit screen. Then paste in your book blurb in the field labeled Description. Click OK and you’re done. 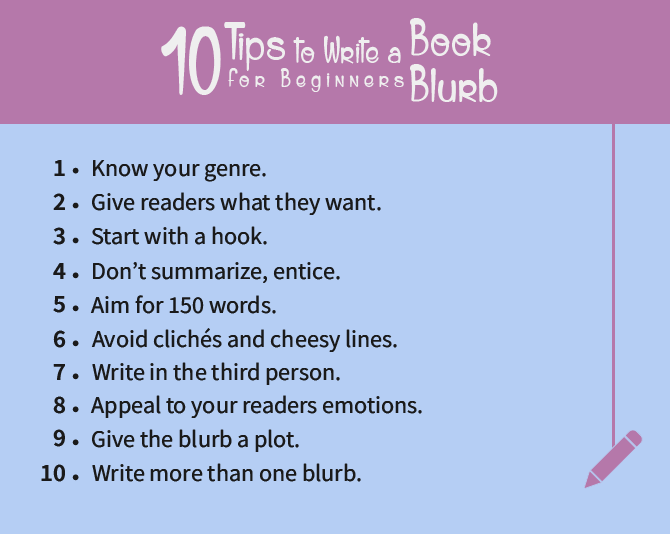 Writing a good ebook blurb can be easy once you get the hang of these ten tips. Go ahead and start collecting your favorites, then hack out a bunch of sample blurbs. Once you’ve started it’s not nearly as intimidating as it may have seemed at first. So what’s stopping you from coming up with yours right now?